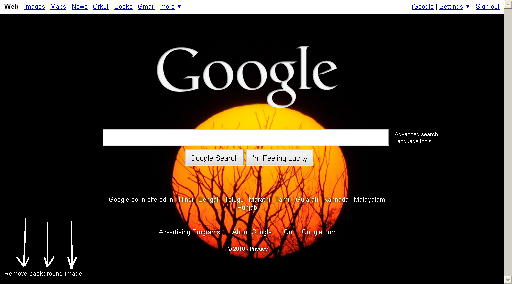 Google has recently launched a new feature that grants you the freedom to customize the Google homepage by selecting your own image or photo to appear as the background. Some find this new innovation akin to a refreshing fount and for some others it’s a Chinese water torture as they would love to use the Classic Google homepage which has a clean, uncluttered look and is loads faster. As Google has already dived in this feature, there should be no looking back in-spite of some slating comments. All they can do is make the next version better, implementing some new ideas recommended by users. Using this new feature users can select a background image from their PC’s, Picasa Web photos, Google public gallery or from Editor’s pics. Sign-in to your Google Account and in the bottom left corner of the Google homepage, you can see the link to Change background image. Click on it and see what shows up. From the left pane of the pop-up window that show up, choose the location from where you want to select your background image. As mentioned earlier, you have option to choose from your Picasa Web photos, your computer, Google public gallery or from Editor’s pics that consists of a set of Google recommended images. 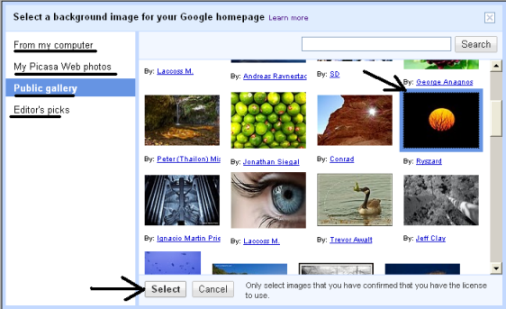 After choosing your image, click Select and voila, your new Google homepage background is live! To remove your new background image and revert back to Classic homepage, just click the link that says ‘Remove background image‘ in the bottom left corner of the homepage and it turns into ‘Change background image‘ taking you back to the default homepage background. To speed-up the user experience on this whole process, it would have been tad better if Google allowed users to change the background image without first having to remove the current one and also provided a separate button to ‘Disable background image’ which now appears only after the background image has been set. Whatdayathink? If you find any option missing and wanted to see it included in the next release, then you can go ahead and submit your product ideas to help make Google products better.